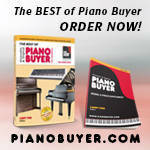 The following article is excerpted from “Piano Buying Basics” in Acoustic & Digital Piano Buyer. Acoustic & Digital Piano Buyer is a semiannual publication concerning new, used, and restored acoustic pianos and digital pianos. The publication is a hybrid book and magazine. The “book” part consists of a series of tutorial articles, illustrated and in color, each covering a different aspect of the piano-buying experience. These articles will not change, or will change very little, from issue to issue. The “magazine” part consists of articles of more temporary interest, and reference material (current prices, specifications, etc. ), that will change over time. Piano Buyer is available both as a free electronic publication and in a print version that can be purchased online or in bookstores. The excerpt that follows will provide readers who have no prior experience with pianos with the essential terminology and concepts needed to shop for one. The actual article also covers additional topics, such as Rent or Buy, The Piano Dealer, Shopping Long-Distance via the Internet, The Piano Warranty, and Miscellaneous Practical Considerations (benches, middle pedal, fallboard). Please see www.PianoBuyer.com for more information. An acoustic piano can be one of the most expensive—and difficult—purchases most households will ever make. The “difficult” aspect arises from several factors that are peculiar to pianos and the piano business. First, a “modern” piano is essentially a 19th-century creation about which few people—even those who have played piano all their lives—know very much, and about which much of what they think they know may not be accurate or current. Thus, a person who sets out to buy a piano is unlikely to have a social support network of family and friends to serve as advisors, as they might if buying a car, house, or kitchen appliance. Even music teachers and experienced players often know little about piano construction or the rapidly changing state of piano manufacturing. They often rely on their past experience with certain brands, most of which have changed significantly. Second, acoustic pianos are marketed nationally in the United States under some 70 different brand names (plus dozens of additional names marketed locally) from a dozen countries, in thousands of furniture styles and finishes—and that’s just new pianos! Many once-popular brands have long gone out of business, yet pianos still bearing their name are made overseas, often to much lower standards, and marketed here. 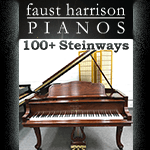 Add in more than a century’s worth of used pianos under thousands of brand names in an almost infinite variety of conditions of disrepair and restoration. Just thinking about it makes me dizzy. Third, new pianos can vary in price from $2,000 to $200,000. But unlike most consumer items, whose differences can be measured by the number of functions performed, or buttons, bells, whistles, and conveniences contained, most pianos, regardless of price, look very similar and do pretty much the same thing: they’re shiny and black (or a wood color), play 88 notes, and have three pedals. The features advertised are often abstract, misleading, or difficult to see or understand. For this reason, it’s often not clear just what you’re getting for your money. This can lead to decision-making paralysis. Last, while many piano salespeople do an honest and admirable job of guiding their customers through this maze, a significant minority—using lies, tricky pricing games, and false accusations against competing dealers and brands—make the proverbial used-car salesman look like a saint. And once you get through haggling over price—the norm in the piano business—you may be ready for a trip to a Middle East bazaar. The purpose of this article is modest: to provide an overview of the piano-buying process, with an emphasis on the decisions you’ll have to make along the way, and on the factors that will affect any acoustic piano purchase. To do this succinctly, it will be necessary to make a number of generalizations, which you can discard in favor of more complete or nuanced explanations as you advance toward your goal. References are given to other articles in this publication, or to The Piano Book, for further information on selected topics. In addition, for answers to specific questions that arise while you shop, I recommend visiting the Piano Forum at Piano World (forum.pianoworld.com), the premiere website for everything related to pianos and pianists. A little bit (but not too much) of technical information about the piano is useful to have while shopping for one. Important words are in boldface. A piano can be thought of as comprising four elements: mechanical, acoustical, structural, and cabinetry. Mechanical: When you press a piano key (usually 88 in number), the motion of your finger is transmitted through a series of levers and springs to a felt-covered wooden hammer that strikes the strings to set them vibrating. This complex system of keys, hammers, levers, and springs is known as the action. Also, when you press a key, a feltdamper resting against each string lifts off, allowing the string to vibrate. When you let the key up, the damper returns to its resting place, stopping the string’s vibration. Pedals, usually three in number, are connected to the action and dampers via trapwork levers, and serve specialized functions such as sustaining and softening the sound. The right-foot pedal is called the damper or sustain pedal; it lifts all the dampers off all the strings, allowing the strings to ring sympathetically. The left-foot, soft pedal (on a grand piano, the una corda pedal) softens the sound. The function of the middle pedal varies depending on the type and price level of the piano (more on that later). As a sostenuto pedal, it selectively sustains notes or groups of notes, a function required only rarely in a small percentage of classical compositions. Other possible functions for the middle pedal include a damper pedal for the bass notes only, and a mute pedal that reduces the sound volume by about half. Acoustical: Piano strings are made of steel wire for the higher-sounding notes (treble), and steel wire wrapped with copper for the lower-sounding notes (bass). They are graduated in thickness, length, and tension, and strung tightly across the structural framework of the piano. Each note has one, two, or three strings associated with it. Each such set of strings is known as a unison because all the strings in a set vibrate at the same pitch. The strings lie across narrow hardwood bridges that transmit their vibrations to a wooden soundboard, usually made of spruce. The relatively large area of the soundboard amplifies what would otherwise be a rather weak sound and broadcasts the sound to the ears. The dimensions, arrangement, and positioning of all the acoustical elements in a piano is known as the piano’s scale design. The scale design varies with the model and is a major determinant of the piano’s tone. Structural: The strings are strung across a gold- or bronze-colored plate (sometimes called a frame or harp) of cast iron, which is bolted to a substantial wooden framework. This heavy-duty structure is necessary to support the many tons of tension exerted by all the taut strings. A vertical, or upright, piano is one in which the structural element stands vertically, and is most commonly placed against a wall. A grand piano is one in which the structural element lies horizontally. In a vertical piano, the wooden framework consists of vertical back posts and connecting cross beams. In a grand, wooden beams and the familiar curved rim comprise the framework. One end of each string is anchored to the plate toward the rear of a grand or the bottom of a vertical piano. The other end is coiled around a tuning pin embedded in a laminated hardwood pinblock hidden under the plate at the front (grand) or top (vertical). A piano is tuned by turning each tuning pin with a special tool to make very slight adjustments in the tension of its string, and thus to the string’s frequency of vibration, or pitch. Cabinetry: The piano’s cabinet (vertical) or case (grand) provides aesthetic beauty and some additional structural support. 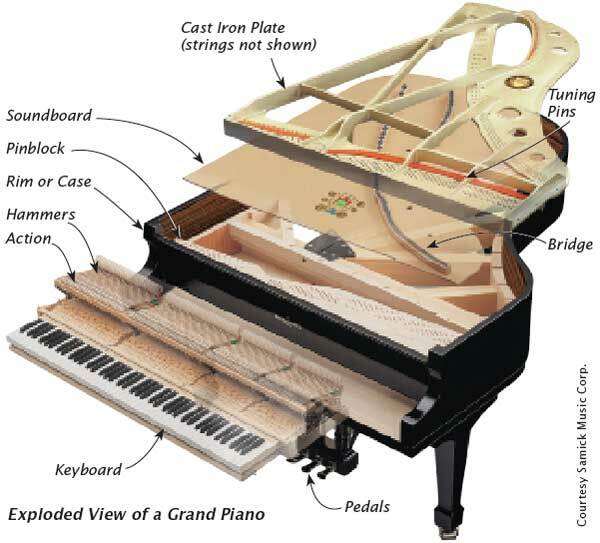 A grand piano’s rim is part of both the wooden structural framework and the case. Accessory parts, such as the music desk and lid, are both functional and aesthetic in purpose. Although the acoustical and structural elements have been described separately, in fact the plate, wooden framework, soundboard, bridges, and strings form a single integrated unit called the strung back. A piano, then, consists of a strung back, an action, and a cabinet or case. Probably the most basic decision to make when buying a piano—and one you may have made already—is whether to buy a vertical or a grand. The following describes some of the advantages and disadvantages of each. Sound tends to bounce back into player’s face, making subtle control of musical expression more difficult. Action is not as advanced as grand; repetition of notes is slower and less reliable in most cases, and damping is sometimes less efficient. Keys are shorter than on grands, making subtle control of musical expression more difficult. Cabinetwork is usually less elegant and less impressive. Vertical pianos are suitable for those with simpler musical needs, or where budget and space constraints preclude buying a grand. Despite the disadvantages noted above, some of the larger, more expensive verticals do musically rival smaller, less expensive grands. They may be a good choice where space is at a premium but a more subtle control of musical expression is desired. Sound develops in a more aesthetically pleasing manner by bouncing off nearby surfaces and blending before reaching player’s ears, making it easier to control musical expression. More sophisticated action than in a vertical. Grand action has a repetition lever to aid in the speed and reliability of repetition of notes, and is gravity-assisted, rather than dependent on artificial contrivances (springs, straps) to return hammers to rest. Longer keys provide better leverage, allowing for significantly greater control of musical expression. Casework is usually more elegant and aesthetically pleasing. Both verticals and grands come in a wide variety of sizes. The important thing to know here is that size is directly related to musical quality. Although many other factors also contribute to tonal quality, all else being equal, the longer strings of larger pianos, especially in the bass and mid-range sections, give off a deeper, truer, more consonant tonal quality than the strings of smaller pianos. The treble and bass blend better and the result is more pleasing to the ear. Also, longer grands usually have longer keys that generally allow superior control of musical expression than shorter grands. Therefore, it’s best to buy the largest piano you can afford and have space for. Small differences in size between models are more significant in smaller pianos than in larger ones. However, a difference in size of only an inch or two is generally irrelevant, as it could be merely due to a larger cabinet or case. Vertical pianos are measured from the floor to the top of the piano. Verticals less than 40″ tall are known as spinets. They were very popular in the post–World War II period, but in recent years have nearly died out. Verticals from 40″ to about 43″ or 44″ are called consoles. Spinet and console actions must be compromised somewhat in size or placement within the piano to fit them into pianos of this size. The tone is also compromised by the shorter strings and smaller soundboard. For this reason, manufacturers concentrate on the furniture component of spinets and consoles and make them in a variety of decorator styles. They are suitable for buyers whose piano needs are casual, or for beginning students, and for those who simply want a nice-looking piece of furniture in the home. Once students progress to an intermediate or advanced stage, they are likely to need a larger instrument. Studio pianos, from about 44″ to 47″, are more serious instruments. They are called studios because they are commonly found in the practice rooms of music schools. Manufacturers make them in both attractive furniture styles for the home and in functional, durable, but aesthetically bland styles for school and other institutional use. If you don’t require attractive furniture, you may save money by buying the school style. In fact, many buyers prefer the simple lines of the institutional models. Verticals about 48″ and taller, called uprights, are the best musically. New ones top out at about 52″, but in the early part of the 20th century they were made even taller. The tallest verticals take up no more floor space than the shortest ones, but some buyers may find the taller models too massive for their taste. Most uprights are made in an attractive, black, traditional or institutional style, but are also available with exotic veneers, inlays, and other touches of elegance. The width of a vertical piano is usually a little under five feet and the depth around two feet; however, these dimensions are not significantly related to musical quality. Grand pianos are measured with the lid closed from the very front of the piano (keyboard end) to the very back (the tail). Lengths start at 4′ 6″ and go to over 10′ (even longer in some experimental models). Widths are usually around 5′ and heights around 3′, but only the length has a bearing on musical quality. Grands less than 5′ long are the musical equivalent of spinets and consoles; that is, they are musically compromised and are mainly sold as pieces of furniture. Grands between about 5′ and 5 1/2′ are very popular. Although slightly compromised, they can reasonably serve both musical and furniture functions and are available in many furniture styles. (By the way, piano professionals prefer the term small grand to baby grand. Although there is no exact definition, a small grand is generally one less than about 5 1/2′ long.) Above 5 1/2′, pianos rapidly improve, becoming professional quality at about 6′. Pianos intended for the home or serious professional top out at about 7′ or 7 1/2′. These sizes may also satisfy the needs of smaller concert venues. Larger venues require concert grands, usually about 9′ long. When considering what size of piano is right for your home, don’t forget to add two to three feet to the length of a grand or the depth of a vertical for the piano bench and pianist. Shoppers tend to underestimate what will fit and buy smaller pianos than necessary. Sometimes, the next-size-larger instrument can give you a great deal of tonal improvement at little additional cost. Dealers can usually lend you templates corresponding to different piano sizes to lay down on your floor so you can measure what will fit. Most new vertical pianos sell in the range of $3,000 to $10,000, though some higher-end ones cost two or three times that, and a few cost less. Entry-level grand pianos generally go for $5,000 to $10,000, mid-range grands from $10,000 to $30,000, and high-end grands for $30,000 to $100,000 or more. Unrestored but playable used pianos cost from perhaps 20 to 80 percent of the cost of a comparable new instrument, depending on age and condition, with 15-year-old used pianos coming in at about 50 percent. The cost of restored instruments will be discussed later. More complete and accurate information can be found in the articles on new and used pianos, and in the “Model & Pricing Guide” reference section . Like just about everything else you can buy, pianos come in a range of quality levels. When we speak of quality in a piano, we are referring to how it sounds, plays, and looks, and how well it will hold up with time and use. These are functions of the care taken in the design of the instrument; the quality of the materials used and how they are assembled; and the amount of handwork put into the final musical and aesthetic finishing of the instrument. With a new piano, we are also concerned, to a lesser extent, with how much pre-sale service is required by the dealer to make the instrument ready—a dealer is less likely to perform a lot of “make-ready” on an inexpensive piano. Also important are the terms of the warranty and the manufacturer’s (or other warrantor’s) reputation for honoring warranties. The prestige value of the name and the history of the brand may also be perceived as a form of quality by some buyers. The Piano Book goes into great detail about what creates quality in a piano. As you can imagine, any discussion of quality in pianos is likely to involve a lot of subjectivity and be somewhat controversial. However, a useful generalization for the purpose of discussing quality can be had by dividing pianos into two types: performance-grade and consumer-grade. Performance-grade pianos are made to a single, high quality standard, usually in relatively small quantities, by companies that strongly favor quality considerations over cost. Consumer-grade pianos, on the other hand, are built to be sold at a particular price, and the design, materials, and level of workmanship are chosen to fit that price. Most consumer-grade pianos are mass-produced at a variety of price levels, with materials and designs chosen accordingly. Throughout much of the 20th century, the United States produced both types of piano in abundance. At the present time, however, most performance-grade pianos are made in Europe, Japan, and the United States, while virtually all consumer-grade pianos are made in Asia. The above explanation of quality in pianos is very general, and some aspects of quality may be more applicable to your situation than others. Therefore, it pays to take some time to consider exactly what you expect from your piano, both practically and in terms of lifestyle. Practical needs include, among others, the level of expressiveness you require in the piano’s tone and touch, how long you want the instrument to last or intend to keep it, and what furniture it must match—as well as certain functional considerations, such as whether you use the middle pedal, desire a fallboard (key cover) that closes slowly, or need to be able to lock the piano. Lifestyle needs are those that involve the prestige or artistic value of the instrument, and how ownership of it makes you feel or makes you appear to others. Just as a casual driver may own a Mercedes, or one devoid of artistic abilities may own great works of art, many who don’t play a note purchase expensive pianos for their artistic and prestige value. A couple of the practical considerations require further discussion. Concerning expressiveness: What kind of music do you play or aspire to play? One can play any kind of music on any piano. However, some pianos seem better suited in tone and touch than other kinds to some kinds of music. Quality in piano tone is often defined in terms of the instrument’s ability to excel at pleasing players of so-called “classical” music because this kind of music tends to make the greatest expressive demands on an instrument. So if you aspire to play classical music seriously, you may wish to one day own a fine instrument capable of the nuanced tone and touch the music demands. On the other hand, if classical music isn’t your thing, you can probably get away with a much less expensive instrument. A key factor concerns how long you want to keep the instrument: Is it for a beginner, especially a youngster, and you’re not sure piano lessons will “stick”? Is it a stepping stone to a better piano later on? Then an inexpensive piano may do. Do you want this to be the last piano you’ll ever buy? Then, even if your playing doesn’t yet justify it, buy a piano you can grow into but never grow out of. A note about how long a piano will last—a question I hear every day. The answer varies for pianos almost as much as it does for people. A piano played 16 hours a day in a school practice room might be “dead” in ten years or less, whereas one pampered in a living room in a mild climate might last nearly a century before requiring complete restoration to function again. A rule-of-thumb answer typically given is that an average piano under average conditions will last 40 to 50 years. If past experience is any guide, it would not be unreasonable to predict that the best-made pianos will last about twice as long as entry-level ones, given similar conditions of use and climate. However—and this is the important point—most pianos are discarded not because they no longer function—in fact, they may go on to long lives as used pianos for other people—but because they no longer meet the needs or expectations of their owners or players. A player may have musically advanced beyond what the instrument will deliver, or the owner may now be wealthier and have higher expectations for everything he or she buys—or perhaps no one in the house is playing anymore and the piano is just taking up space. Thus, the important consideration for most buyers, especially buyers of new or relatively young pianos, is how long the piano in question will meet their needs and expectations, rather than how long that piano will last. You’ll get a better sense of what quality means in a piano if you play a wide variety of them, including ones that cost less than what you plan to spend, as well as ones you can’t afford. Warning: The latter can prove dangerous to your bank account. It’s not unusual for a buyer to begin shopping with the intention of buying a $3,000 vertical, only to emerge some time later with a $30,000 grand! A subset of used pianos consists of instruments that have been professionally restored. 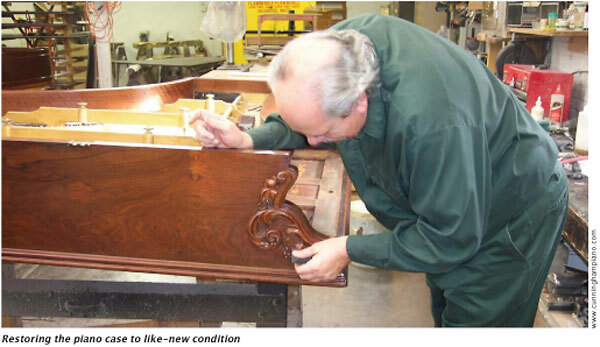 The complete restoration of a piano is known as rebuilding. There is no universally agreed-on definition of what is included in a rebuilding job, so you have to ask specifically what has been done. A minimal partial restoration is called reconditioning—often just cleaning up the piano, replacing a few parts, and adjusting it. Vertical pianos are almost never completely rebuilt because the cost cannot be recouped in the sale price. However, verticals are frequently reconditioned. A complete rebuilding of a top-quality grand piano by a top-notch rebuilder generally costs from $20,000 to $40,000—and that’s if you own the piano. If you’re buying the piano too, figure a total cost of from 75 to more than 100 percent of the cost of a new piano of similar quality. A partial rebuilding of a lower-quality brand might cost half that, or even less. Buying a used or restored piano is generally more difficult than buying a new one because, in addition to making judgments about the underlying quality of the instrument, you also must make judgments about its condition or about the skill and trustworthiness of the restorer—there’s a greater concern about being burned if you make a mistake. Some find this too stressful or time-consuming. Others find the hunt fascinating, and end up discovering an entire world of piano buffs, and piano technical and historical trivia, in their community or online. It helps to remember that a new piano becomes “used” the moment it is first sold. Although junk certainly exists, used pianos actually come in a bewildering variety of conditions and situations, many of which can be quite attractive, musically and financially. The subject is vast. The Piano Book has a chapter devoted to it, including how to do your own preliminary technical examination of a piano. A summary of the most important information, including a description of the most common types of used pianos, where to find them, and how much to pay, can be found in the article “Buying a Used or Restored Piano”. The prices of new pianos are nearly always negotiable. Only a handful of dealers have non-negotiable prices. If in doubt, just ask—you’ll be able to tell. Some dealers carry this bargaining to extremes, whereas others start pretty close to the final price. Many dealers don’t like to display a piano’s price because not doing so gives them more latitude in deciding on a starting price for negotiation, depending on how they size up the customer. This makes shopping more difficult. Use the price information in the “Model & Pricing Guide” to determine the likely range within which a given model will sell. Don’t give in too quickly. It’s quite common for the salesperson to call a day or two later and offer a lower price. If there’s an alternative piano at another dealership that will suit your needs just as well, it will help your negotiating position to let the salesperson know that. Due to the high cost of advertising and conducting piano mega-sales (such as college sales, truckload sales, etc. ), prices at these events are often actually higher than the price you could negotiate any day of the week, and the pressure to buy can be enormous. Shop at these sales only after you’ve shopped elsewhere, and look for the real bargains that occasionally exist. If you’re buying a new piano to replace one that’s no longer satisfactory, you’ll probably want to trade in the old one. Dealers will usually take a trade-in, no matter how bad it is, just to be able to facilitate the sale. In fact, in many cases the dealer will offer you what seems like a king’s ransom for the old one. The downside is that when a generous trade-in allowance is given on the old piano, the dealer is then likely to offer you a less-generous price on the new one. To see if you’re being offered a good deal, you’ll have to carefully analyze the fair-market value of the old piano and what would be a likely price for the new one without a trade-in. Sometimes it will be to your advantage to sell the old piano privately, though in that case you’ll need to take into account the hassle factor as well. For more information about new-piano prices and negotiating, see the introduction to the “Model & Pricing Guide,” as well as in The Piano Book. Used-piano prices may or may not be negotiable. If the used piano is being sold by a dealer who primarily sells new pianos at negotiable prices, then the used-piano prices are probably also negotiable. Prices of restored pianos sold by the restorer are less likely to be negotiable, as technical people are usually less comfortable with bargaining. Prices of pianos for sale by private-party sellers are usually negotiable, in part because the seller often has little idea of what the piano should sell for and has just made up a price on the basis of wishful thinking. But even knowledgeable sellers will usually leave a little wiggle room in their price. Prior to the Great Depression, most pianos were outfitted with player-piano mechanisms—the kind that ran on pneumatic pressure and paper rolls. Today’s player pianos are all electronic; they run on CDs, iPods, floppy diskettes, or electronic downloads from the Internet, and are far more versatile and sophisticated than their pneumatic ancestors. Now you don’t have to wait until Junior grows up to hear something interesting from the piano! 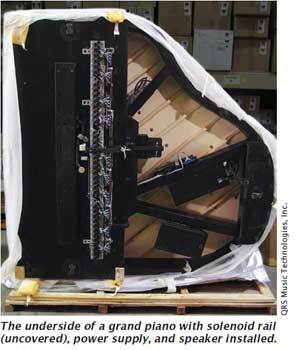 A substantial percentage of new pianos, especially grands, are being outfitted with these systems. In fact, many pianos are being purchased as home-entertainment centers by buyers who have no intention of ever playing the piano themselves. Several companies make these systems. Yamaha’s Disklavier system is built into select Yamaha models at the Yamaha factory. PianoDisc and QRS Pianomation, the two major after-market systems, can be installed in any piano, new or used, typically by the dealer or at an intermediate distribution point. If installed properly by a trained and authorized installer, none of these systems will harm the piano or void its warranty. However, such installations are complicated and messy and must be done in a shop, not in your home. The most basic system will play your piano and accompany it with synthesized orchestration or actual recorded accompaniment over speakers attached to the piano. These systems generally add about $4,000 to $7,000 to the price of the piano. Add another $1,500 to $2,000 to enable the piano to record your own playing for future playback. For a little bit more, you can mute the piano (stop the hammers from hitting the strings), turn on a digital piano sound, and listen through headphones. The range of prices reflects the variety of configurations and options available, including what music source you use (CD, iPod, MP3 player, etc. ), and how much memory storage you purchase, among others. There are also higher-level systems at twice the price that provide touch screens with wireless connection for instant downloading of songs from the Internet. See the article “Buying an Electronic Player-Piano System” for more information. Although for most buyers the qualities of performance and construction are of greatest importance in selecting a piano, a piano is also a large piece of furniture that tends to become the focal point of whatever room it is placed in. This is especially true of grands. Add to that the fact that you’ll be looking at it for many years to come, and it becomes obvious that appearance can be an important consideration. For some buyers, it may be the most important consideration. Vertical pianos without front legs are known as Continental style (also called Contemporary, European Contemporary, or Eurostyle). They are usually the smallest (42 to 43 inches high) and least expensive pianos in a manufacturer’s product line. School pianos are a subset of the institutional-style category. Generally 45 to 47 inches in height, these are institutional-style pianos made specifically for use in school practice rooms and classrooms. They usually come equipped with long music racks for holding multiple sheets of music, locks for both the lid and the fallboard, and heavy-duty casters for easier moving. They are generally available in ebony or satin wood finishes. Sturdy and sometimes plain-looking, they are also often purchased by non-institutional customers for less furniture-conscious locations. (If you’re buying a piano for an institution, please read “Buying Pianos for an Institution,”. Hybrids styles, containing features of both institutional and decorator styles, are common, especially in Asian pianos. Victorian style (sometimes called Classic style) is an imitation of a style in fashion in the late 1800s, with large, round, fluted legs and a fancy, carved music desk. Variations of the Victorian style have “ice-cream cone” or other types of roundish legs. Pianos come in a variety of woods, most commonly ebony (sometimes called ebonized), which is not actual ebony wood, but an inexpensive, sturdy veneer that has been painted black; as well as mahogany, cherry, walnut, and oak. Exotic woods include bubinga, rosewood, and many others, available on higher-priced uprights and grands. In pianos of lesser quality, sometimes a less expensive wood will be stained to look like a more expensive one. Pianos are also available in ivory or white, and it’s often possible to special-order a piano in red, blue, or other colors. Most piano finishes are either lacquer or polyester. Lacquer was the finish on most pianos made in the first three-quarters of the 20th century, but it is gradually being supplanted by polyester. In my opinion, lacquer finishes—especially high-gloss lacquer—are more beautiful than polyester, but they scratch quite easily, whereas polyester is very durable. (Lacquer finishes can be repaired more easily.) Hand-rubbed satin lacquer is particularly elegant. Sometimes, when a customer desires a piano in a satin finish but the dealer has in stock only the high-polish polyester model, the dealer will offer to buff it down to a satin finish at a cost of $500 to $1,000. This is commonly done, and it works, but usually doesn’t look as nice as the factory-made satin finish. Touch, in its simplest form, refers to the effort required to press the piano keys. Unfortunately, the specifications provided by the manufacturers, expressed in grams, don’t do justice to this complicated subject. The apparent touch can be very different when the piano is played fast and loud than when it is played soft and slow, and this difference is not captured in the numbers. If you are other than a beginner, be sure to try it out both ways. Advanced pianists tend to prefer a touch that is moderately firm because it provides better control than a very light touch and strengthens the muscles. Too light a touch, even for a beginner, can cause laziness, but too firm a touch can be physically harmful over time. The touch of most new pianos today is within a reasonable range for their intended audience, but the touch of older pianos can vary a lot depending on condition. A piano teacher may be able to assist in evaluating the touch of a piano for a beginner, particularly if considering an entry-level or used piano. Piano tone is also very complex. The most basic aspect of tone, and the one most easily changed, is its brightness or mellowness. A bright tone, sometimes described by purchasers as sharp or loud, is one in which higher-pitched overtones predominate. A mellow tone, sometimes described as warm, dull, or soft, is one in which lower-pitched overtones are dominant. Most pianos are somewhere in between, and vary from one part of the keyboard to another, or depending on how hard one plays. The key to satisfaction is to make sure that the tone is right for the music you most often play or listen to. For example, jazz pianists will often prefer a brighter tone, whereas classical pianists will often prefer one that is mellower, or that can be varied easily from soft to loud; i.e., that has a broad dynamic range. However, there is no accounting for taste, and there are as many exceptions to these generalizations as there are followers. A piano technician can make adjustments to the brightness or mellowness of the tone through a process known as voicing. Another aspect of tone to pay attention to is sustain, which is how long the sound of a note continues at an audible level, while its key is depressed, before disappearing. Practically speaking, this determines the ability of a melodic line to “sing” above an accompaniment, especially when played in the critical mid-treble section. Most pianos will play loudly quite reliably, but providing good expression when played softly is considerably more challenging. When trying out a piano, be sure to play at a variety of dynamic levels. Test the action with your most technically demanding passages. Don’t forget to test the pedals for sensitivity commensurate with your musical needs. Room acoustics have a tremendous effect on piano tone, so you’ll want to note the extent to which the acoustics of the dealer’s showroom differ from those of your home, and make allowance for it. Hard surfaces, such as bare walls, tile, and glass will make the tone brighter. Absorbent surfaces—upholstered furniture, heavy drapes, plush carpeting—will make it mellower. Once the piano is in the home, a technician may be able to make adjustments to the tone, but to avoid unpleasant surprises, it’s best to buy a piano whose tone is already close to what you want. Adjusting the room acoustics through the strategic use of wall hangings, scatter rugs, and furniture can also help. See the article ” Ten Ways to Voice a Room.